It seems every time I go somewhere with my friend Gillian, she needs me to drive her (even though she has her own motorbike). So I drive her. But she’s what we call a Backseat Driver - a bit like a Backstreet Boy, but less annoying. That means she sits on the back seat of my Wave and tells me how to drive. Mostly she tells me to stop honking. She says I should not honk for two reasons. I understand the reasons, but I will not stop. In these big cities there is a lot of noise pollution. There are rules for driving in the US, and we generally follow them. For example, we stop at an intersection, look left, then right, then continue... if it’s safe. We (generally, mind you) follow these rules, not because the police might catch us, but because it’s safer for everyone, including me. But this is not America. 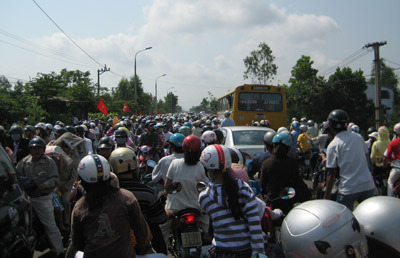 And, I’m sorry, but the way people drive in Vietnam is f#? *%g crazy! You never know what somebody will do here. Turn around suddenly into oncoming traffic. Drive straight at you, coming down the wrong side of the road. My first Vietnamese driving experience was in Ninh Binh. I rented a motorbike and we started our trip to Phat Diem (the strangest church I’ve ever seen, by the way). Driving carefully and straight, my girlfriend on the back, somebody, with a small child on the motorbike, came speeding out of a little alley, going maybe 30k per hour. He hit us. We fell onto the other side of the road and a large bus with a large tire came extremely close to crushing this skull, which my parents so kindly made for me, like a watermelon. Thankfully it wasn’t crushed, as you can see I can still type (and sometimes even think). But the sight of the huge bus tire taught me something. You need to honk in Vietnam. Now, when driving, I look at everyone around me. I try to use telepathy to figure out the ones who might do something crazy - swerve for no reason, make a sudden stop because they see something they want to buy. I even look up from time to time to make sure a motorbike isn’t coming out of the trees. And I honk and honk. I’m here, don’t kill me please. The second reason she says I shouldn’t honk is that it adds to the terrible noise on the streets. I agree with her. In these big cities there is a lot of noise pollution. We don’t honk in America, unless it’s necessary. She’s right, it is an ugly and constant noise. I can hear it right now, from my room in a small alley. But if I stopped honking today, the noise would not stop. Everyone else would still do it. Sure, there may come one day when everyone will decide to be polite when driving; to be careful and look before turning; not honk at every vehicle, pedestrian and dog they pass on the street. But I won’t be the first one to stop. So until that day, I’m going to keep honking like a xe om driver. Even if I’m adding a tiny bit to the noise pollution, I’ll keep honking because I don’t want some guy, driving home from work, to suddenly remember that his house is on the left instead of the right, then change direction with no warning, and into me and throwing me into the path of an oncoming bus. That could hurt my head, which would probably upset my mother.